Technology is not only an object of philosophical reflection but also something that can change this reflection. 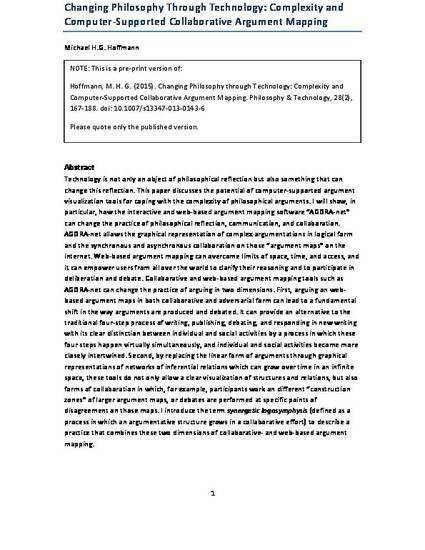 This paper discusses the potential of computer-supported argument visualization tools for coping with the complexity of philosophical arguments. I will show, in particular, how the interactive and web-based argument mapping software “AGORA-net” can change the practice of philosophical reflection, communication, and collaboration. AGORA-net allows the graphical representation of complex argumentations in logical form and the synchronous and asynchronous collaboration on those “argument maps” on the internet. Web-based argument mapping can overcome limits of space, time, and access, and it can empower users from all over the world to clarify their reasoning and to participate in deliberation and debate. Collaborative and web-based argument mapping tools such as AGORA-net can change the practice of arguing in two dimensions. First, arguing on web-based argument maps in both collaborative and adversarial form can lead to a fundamental shift in the way arguments are produced and debated. It can provide an alternative to the traditional four-step process of writing, publishing, debating, and responding in new writing with its clear distinction between individual and social activities by a process in which these four steps happen virtually simultaneously, and individual and social activities become more closely intertwined. Second, by replacing the linear form of arguments through graphical representations of networks of inferential relations which can grow over time in an infinite space, these tools do not only allow a clear visualization of structures and relations, but also forms of collaboration in which, for example, participants work on different “construction zones” of larger argument maps, or debates are performed at specific points of disagreement on those maps. I introduce the term synergetic logosymphysis (defined as a process in which an argumentative structure grows in a collaborative effort) to describe a practice that combines these two dimensions of collaborative- and web-based argument mapping.